Michigan Avenue Bridge circa 1952. From Cedar Point In The Moonlight, Summer, 1935. 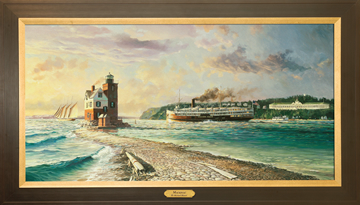 The 1930's was the “high point” for the excursion business on Lake Erie. 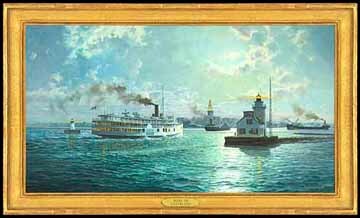 Sailing from Cleveland, Put-In-Bay, Detroit and Buffalo, all passengers remembered the “goodtime" had by all while cruising and dancing on the steamer Goodtime. 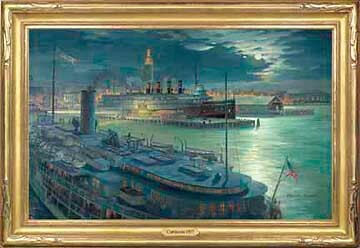 By the beginning of WWII, the Goodtime was out of service and finally sold for scrap in 1941. The same moon still reflects over Cleveland's lake front. Most all else is lost except the familiar outline of Terminal Tower. The steam mechanics and subtle vibrations of the magnificent lake steamers Goodtime and Seeandbee were silenced forever by the outset of World War II. I wanted a unique view of Harbor Springs. This is what “the sea gull saw” flying over the Little Harbor Club looking toward the North East. Harbor Springs has pride of place. It is not a drive through town – it's a destination. My first visit to Harbor Springs was in 1967. Many things have changed since but some are still the same. The cool wind still blows off the lake and the light on the Point and stars above still shimmer on this lovely bay. Beauty and romance surround this magical island made famous in the hearts of millions by the movie “Somewhere In Time”. The S.S. South American created true romance for the thousands of travelers who remember her. That’s right, Mackinac (the last C is silent) doesn’t really have a place in a river art catalog, but it is my catalog and I worked my way through college as a bellman at the Grand Hotel. In the late 1960’s we worked seven days a week and the hotel was staffed in those days by college kids working for the summer. The Steamer WESTERN STATES shown in the image was a real packet style steamboat. Another reason I added the scene is my enjoyment of the lighthouse on Round Island. The old lighthouse was extinguished in 1958 and thru the efforts of the Round Island Lighthouse Society it was lighted again in 1996. The wise people of Mackinac have made it a point to keep the 21st century at arms length. The transportation and the architecture is strictly 19th Century. If you have never seen the old movie Somewhere in Time, go rent it at the video store. Light the fire in the fireplace and open a bottle of wine. The movie is considered a cult classic for the 60+ crowd. $1,450 (plus shipping and crate). Many remember high school trips on the S.S. South American in the 1960's. Her crew was composed of many college students working on the vessel as a summer job trying to earn money for tuition. 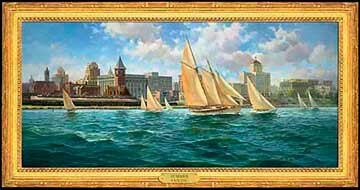 Frame denotes print available as Giclee on canvas The Finish Line depicts the finish of a contemporary sailboat race off of Round Island Lighthouse at Mackinac Island. 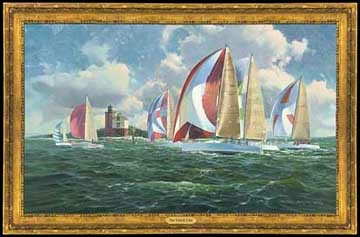 The painting is reproduced in giclee format only. The schooner Melitta laden with Christmas trees works her way up the Milwaukee River in 1908. 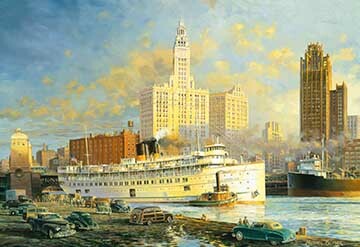 Also featured is the whaleback passenger ship Christopher Columbus, the Pabst office building and Milwaukee City Hall. Jones Island was a marsh island right in the middle of the Milwaukee River Basin. The island was settled by Kashubian and German immigrants who made their living by fishing bountiful Lake Michigan. Today, the once bustling community has vanished. A pigeon's eye view of the Milwaukee lake front in 1945. The massive Chicago-Northwestern Train Station, the Hotel Juneau and the Elks Club are now only history.